Florida is a diverse multilingual and multicultural state. It has a rich history of Spanish, Haitian Creole, Portuguese, Vietnamese, and Native People languages, among many others, spoken and used regularly in the state. Florida’s students in grades PK-12 speak more than 300 language varieties. Florida has more than 100 bilingual education programs located in 12 school districts. Miami-Dade County is home of the Coral Way Elementary School, the first dual language program in the US that opened its doors as a two-way program in 1963. For information on Coral Way, see the UF Digital Collection and The Coral Way Dual Language Experiment (M. Coady, 2019 in print with Multilingual Matters). Bilingual programs are programs in which two (or more) languages are used as mediums of instruction to learn academic content such as science, mathematics, and social studies. The most common languages in bilingual education programs across the US are Spanish and English. Students who participate in bilingual education programs attain high levels of bilingualism and biliteracy without detriment to either their first language or their academic progress in content areas (McField & McField, 2014). Bilingual students frequently outperform their monolingual peers on standardized tests. 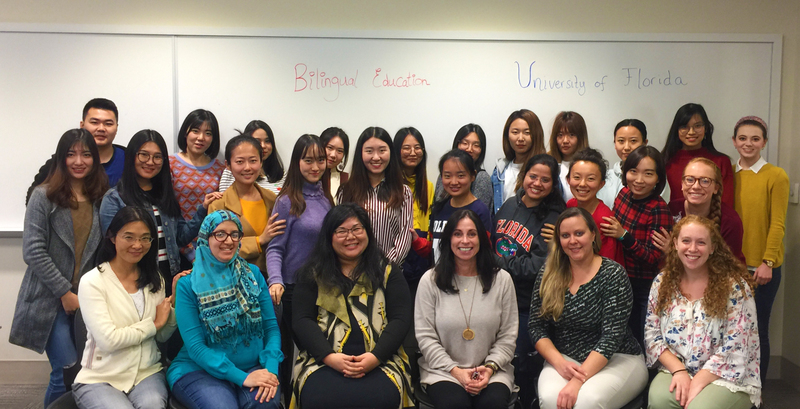 This project was created by graduate students at the University of Florida, Bilingual/ESOL Program Area and Dr. Maria Coady and Dr. Brenda Such. There were 28 students in the fall 2018 class, and each group of students identified bilingual programs within the 13 school districts that stated they offered bilingual programs on their 2016-19 ELL plans. About three-fourths of the participating graduate students were from China. The rationale for this work is that Florida has more than 100 bilingual education programs but no virtual space that demonstrates the work and commitment of bilingual educators, nor how Florida’s students are doing. Importantly, although data on Florida’s English learners (ELs or ESOL students) is demonstrated, many of the students in bilingual education programs are not identified ESOL. Data from this project were obtained from school districts, individual schools, and the Florida Department of Education, EdStats. Student, school, and district achievement data are from the 2017-18 and 2018-19 academic years. The UF graduate students analyzed Florida’s district ELL plans, contacted district teachers and administrators to conduct phone interviews, examined district and school websites, and identified data from FL DOE EdStats. They then compiled their information and source materials to the bilingual education Canvas site.